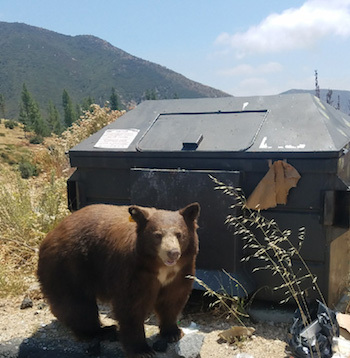 ARCADIA, Calif.; Sept. 26, 2017 – For Immediate Release – The U.S. Forest Service and the California Department of Fish and Wildlife (CDFW) remind citizens visiting or living in the high country and foothills that fall is the time of year for increased bear foraging activity and more human and bear encounters are possible. California black bears are typically active and foraging between April and mid-fall, but in autumn, black bears experience changes in metabolism that drive the need to consume as many rich calories as possible. This metabolic spike is an important signal to the bear to bulk up and gain the fat that will sustain the animal through hibernation and periods of lean food sources. Scientists estimate that black bears may forage as many as 20 hours a day at this time.